Writer/director Bernard Rose’s 1992 adaptation of Clive Barker’s short story ‘The Forbidden’ introduces us to a young woman named Helen Lyle (Virginia Madsen of Dune and Zombie High). She’s and her friend Bernadette Walsh (Kasi Lemmons of The Silence Of The Lambs and Hard Target) are grad students writing a thesis on urban legends. When Helen’s husband, Professor Trevor Lyle (Xander Berkeley of The Walking Dead and Terminator 2: Judgement Day) teaches a class on the subject without her involvement, it inspires her to dig deeper on her own. When she learns about a local urban legend regarding a murderer named Candyman, she and Bernadette start to dig deeper, learning that if you say his name into a mirror five times, supposedly he’ll appear, and so of course, they try it out. Rumor has it that he was a slave who was murdered for messing around with his master’s wife. They eventually find two members of the school’s cleaning crew who are willing to talk to them about it. 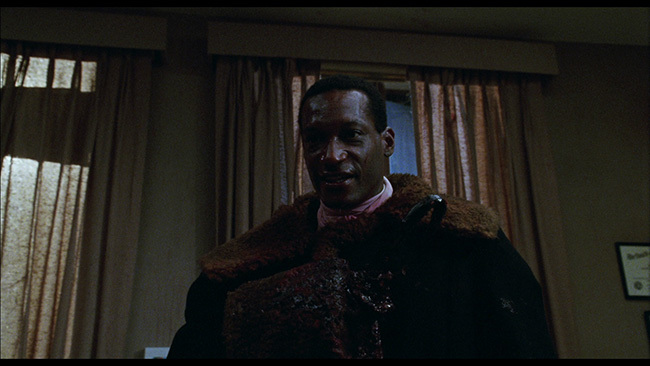 It seems that a few years ago, Candyman (Tony Todd of the Night Of The Living Dead remake, the Hatchet films and the Final Destination films) committed a couple of gruesome murders in the Cabrini Green projects located in the north side of Chicago. 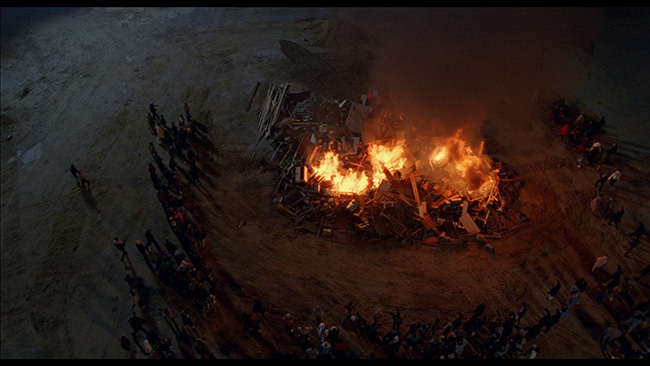 By taking Barker’s original idea and relocating it from London to a Chicago and giving Todd’s character a backstory, Rose manages to craft an intelligent and genuinely eerie film. Candyman essentially feeds on the fear that comes from those who believe in him, integrating himself into the culture of violence that seems to have overtaken Cabrini Green and in turn becoming an important part of its history and culture. This makes the location change a smart one, allowing the film to explore race relations and poverty issues in the big city setting without ever getting too heavy-handed or preachy. In fact, the projects prove the perfect location to stage the film, the massive building complex perfectly capable of housing unseen rooms hidden behind bathroom mirrors and creating an ominous backdrop for so much of what happens in the film. Director Bernard Rose (Immortal Beloved and Anna Karenina), paces the movie perfectly. The movie never feels rushed but neither does it ever really slow down. Rose gets a lot out of Madsen’s performance in the film. She’s strong-willed, a smart character well-played by a talented actress. We believe she’s gutsy enough to do what she does in the film, but she’s never more convincing than when she’s under Candyman’s spell (she was famously hypnotized before these scenes were shot, which would explain how and why they were able to get such a startlingly unique performance out of her). She’s excellent in the part, and so too is Tony Todd. Here the actors deep voice is used perfectly to create a character as frightening as he is seductive, he’s the type of evil that you can’t look away from and it’s not wonder that this is still the role that the actor is most closely associated with. The supporting work from Xander Berkeley, Kasi Lemmon and Vanessa Williams is also very solid, but it’s Madsen and Todd who really make the movie work as well as it does. 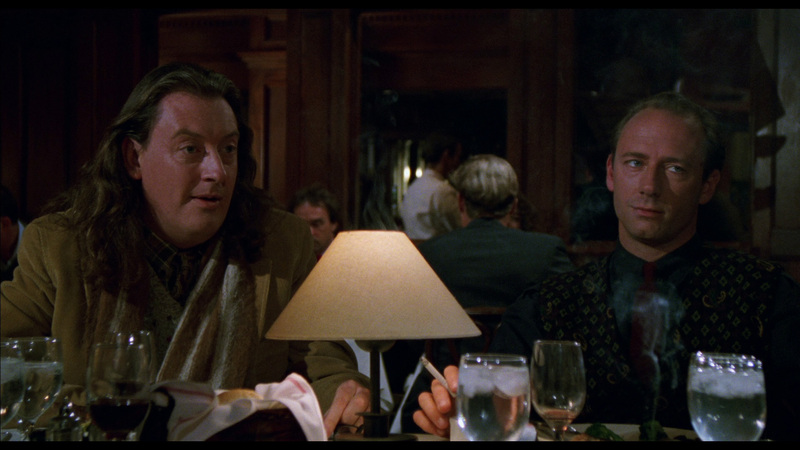 Executive produced by Clive Barker (Hellraiser, Nightbreed) himself, the film also boasts fantastic cinematography from Anthony B. Richmond (who shot Bad Timing and Don’t Look Now for Nicolas Roeg). The camerawork in the film makes the projects into a shadowy, terrifying locale, a place ripe with as much human danger as supernatural. There are some genuinely eerie shots in here, particularly when Helen first crawls through that hole in the wall. Also noteworthy is the unforgettably creepy score from composer Philip Glass (who has scored everything from Soavi’s The Church to The Illusionist). The score uses a lot of organ and a lot of choral arrangements and it’s the type of music that proves unnerving even when not listened to in the context of the film. Note: this two-disc set contains the original U.S. theatrical cut as well as the unrated cut (also known as the UK theatrical cut). What are the differences? Basically, it’s the murder of Dr. Burke. The unrated version is quite a bit gorier and also features some bits where his blood splashes across Helen’s face. This version wasn’t ever released on DVD in the United States, so it’s great to have it now and in high definition no less. 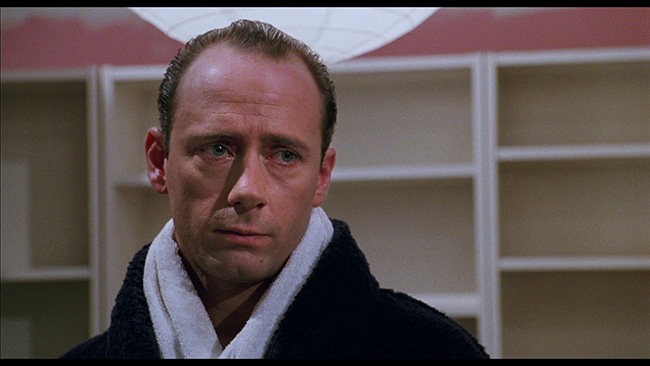 The theatrical cut is taken from a 2k restoration from a new 4K scan of the original negative, supervised and approve by writer/director Bernard Rose and director of photography Anthony B. Richmond. The unrated cut is taken from a new 2K restoration from a new 4K scan of the original negative with high definition inserts for the uncut footage from an archival film print. So, with that in mind it makes sense that there are few spots in the unrated cut where it’s clear that inserts were used. Still, this is an infrequent issue and even when you do notice the drop in quality, it’s never so drastic as to really take you out of the movie at all. The vast majority of the unrated cut looks identical to the theatrical version, which is a very good thing indeed. The image quality here is quite impressive. There’s a lot of detail to take in, not just in close up shots but medium and long-distance shots as well (you can almost feel the grime when Helen goes into that public toilet!). Color reproduction is excellent, you really notice this in the scenes where Helen is poking around in the walls of the projects, that garish graffiti pops up nicely against the darkness. Black levels remain rock solid throughout and the image is devoid of any crush or compression. Occasional inserts notwithstanding, there’s virtually no print damage here, the image is very clean, but not at the cost of natural film grain. Noise reduction and edge enhancement are never problematic and skin tones look just fine throughout. Really, it’s hard to find much to complain about here at all, the picture quality on this release is very impressive indeed. Each version of the movie gets a DTS-HD 5.1 and 2.0 options, in English, with optional subtitles provided in English only. The 5.1 mix sounds good, really just placing some of the effects and the score into the rear channels while keeping the dialogue up front in the mix. It works well, especially with some of the film’s eerie choral arrangements spread out the way they are here. Dialogue stays clean and clear, always easily discernable, and some of the vocal effects employed on Todd’s dialogue in a few scenes also benefits from the use of the surround channels. There’s strong bass here, providing some solid lower end when the movie calls for it. No problems with any hiss or any distortion – again, nothing to complain about really, this all sounds great. This disc begins with an all new audio commentary with writer-director Bernard Rose and actor Tony Todd. This is definitely worth checking out as Rose goes into a lot of detail about adapting the source material, dealing with the producers, his thoughts on Barker’s source, the more political side of the production and more. Todd offers his thoughts on his character and plenty of insight into what went into playing the titular role as well as thoughts on collaborating with the other actors that appear in the film. Unfortunately, there are times where they sort of go off topic and discuss unrelated subjects, but when it’s on, it’s on. A second new audio commentary gets Stephen Jones and Kim Newman together to provide a critical analysis of the film. As this track plays out, they offer their thoughts on the effectiveness of certain aspects of the production, talking about the effects work, the sets and locations, the score, the acting, the atmosphere and plenty more. These guys know their stuff and they do a nice job here. Anthony B. Richmond, how pretty much everyone involved tried to make something different with this picture, working with Todd and Madsen and lots more. From there we dig into the first of a whole bunch of featurettes beginning with the twenty-four-minute Sweets To The Sweet: The Candyman Mythos which is made up of new interviews with director Bernard Rose, producer Alan Poul, executive producer Clive Barker and cast members Virginia Madsen, Tony Todd and Kasi Lemmons. This is well-done. It covers the story behind the making of the film in a fair bit of detail (the commentaries are able to cover more ground but this is more concise! ), noting the film’s literary origins, how it was turned into a film, how Rose came to direct, the casting of the picture and the sequels that would follow in its wake. Clive Barker: Raising Hell is an eleven-minute an interview with, you probably guessed, Clive Barker. He speaks about his thoughts on the picture and how Rose went about turning his short story into the script that became the movie. He also talks about where some of the inspiration for the story came from and a fair bit more. Barker is always an interesting interview subject, fans will appreciate seeing this piece. 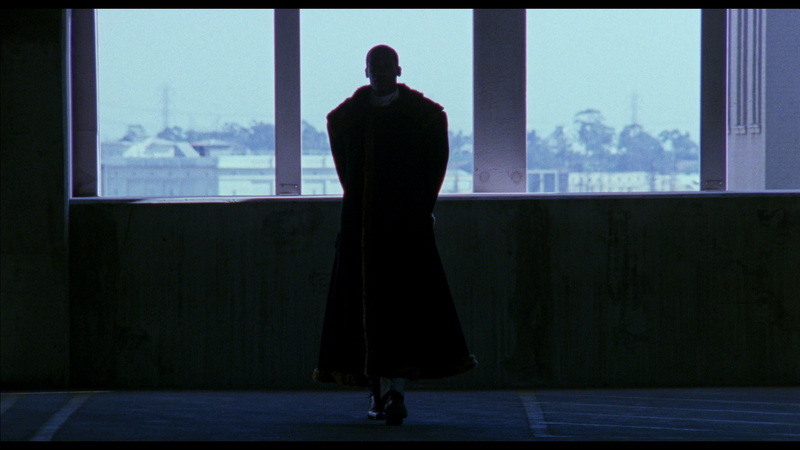 The seven-minute Heart Of Candyman is a 2014 interview with Tony Todd where he speaks fairly candidly about his work on this film and shares his thoughts on the picture, his character and the character’s background. Finishing out the extras on the first disc is a five-minute collection of Bernard Rose’s Storyboards, the film’s original theatrical trailer, ninety-seconds of original TV spots, a still gallery and, for the BD-Rom equipped, the film’s original script in PDF format. Menus and chapter selection are also included. The second disc contains a whole host of new featurettes starting with Be My Victim, a ten-minute interview with Tony Todd. This covers some of the same ground as he’s covered in the other supplements as he talks about his approach to the character and his thoughts on the film. The thirteen-minute It Was Always You, Helen is a new interview with Virginia Madsen. This piece is really interesting as she talks about a lot of things you might not expect, including how she had to adjust her body to fit the character, the difficulties of working with live insects on set, how she got along with her co-stars and how she remains quite fond of the movie these many years later. Reflection In The Mirror interviews actress Kasi Lemmons for ten-minutes. In this piece she gives us some background information on her career and also details the importance of getting to work with Rose and Madsen on the film. She also talks about some of the other projects that she’s had a hand in working on over the years. Interesting stuff. 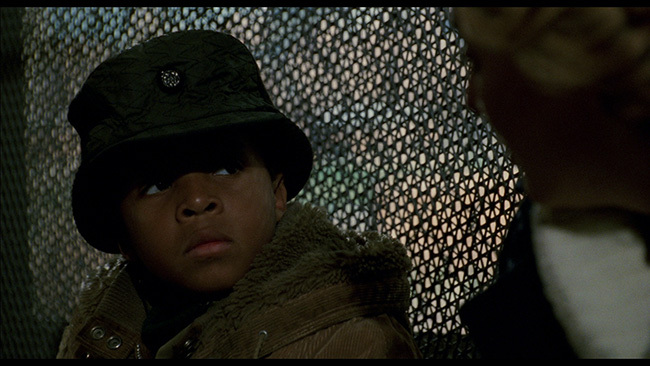 A Kid In Candyman is an awkwardly titled but interesting interview with actor DeJuan Guy that runs fourteen-minutes and explores how he came to play Jake in the film. He comes across as quite good natured, talking about his experiences on set, what it was like being a kid when this movie was made and how he still gets recognized for his part in the film. He looks back on this pretty fondly and offers a unique perspective that the other cast members don’t, given that he was obviously much younger than they were when the film was made. The Writing On The Wall: The Production Design Of Candyman interviews production designer Jane Ann Stewart for just over six-minutes. This is a bit on the short side but it’s interesting nevertheless. She tells an amusing story about how she landed the job on the film and then discusses her work on some of the picture’s more involved scenes, the giant fire at the end being a good example. 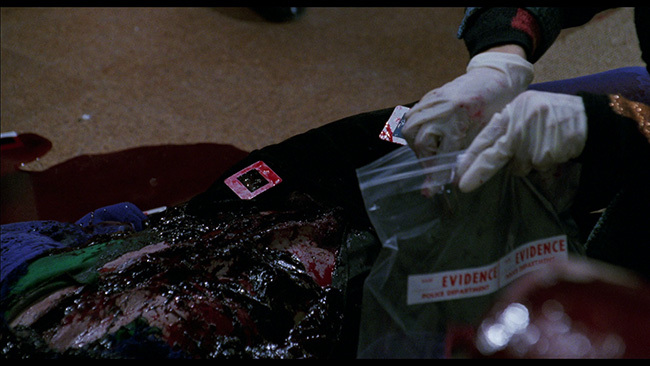 Forbidden Flesh: The Makeup FX Of Candyman is made up of interviews with special makeup effects artists Bob Keen, Gary J. Tunnicliffe and Mark Coulier and lasts just a hair over eight-minutes in length. They talk about having to jump into work on Candyman after immediately having finished Hellraiser III: Hell On Earth and then go into specifics about what was involved in creating some of the film’s nastier and more effects-intensive set pieces. A Story To Tell: Clive Barker’s “The Forbidden” gets Douglas E. Winter in front of the camera to talk about Clive Barker’s Books Of Blood short story series, specifically “The Forbidden,” which was turned into Candyman. This piece lasts just under nineteen-minutes. This piece is very interesting, particularly if you happen to be a fan of the original short story. Winter discusses the differences between what was on the page versus what winds up on the screen, studio involvement, Rose’s specific contributions and much more. 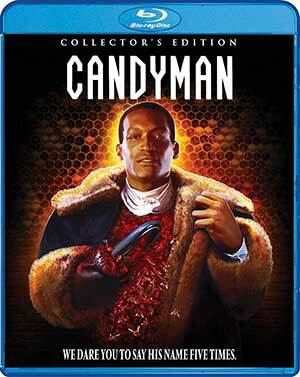 The last piece on the second disc is Urban Legend: Unwrapping Candyman. This is a ‘critical analysis’ of the picture that comes courtesy of writers Tananarive Due and Steven Barnes, lasting just under twenty-one-minutes. This is a thought-provoking examination of a few different aspects of the film, including how it deals with race as well as the way that certain characters are portrayed in the film and why. These guys offer up some interesting food for thought and as such, this is definitely worth checking out. Shout! Factory has really gone all out on this two-disc collector’s edition of Candyman, presenting both cuts of the movie in gorgeous shape and with excellent audio. On top of that, the set is absolutely stacked with extra features, really leaving no stone unturned in covering the film’s history and production. The movie itself holds up really well, a dark, twisted horror that pulls from familiar urban legends and Barker’s macabre source material to create something unique and impressive. Highly recommended! 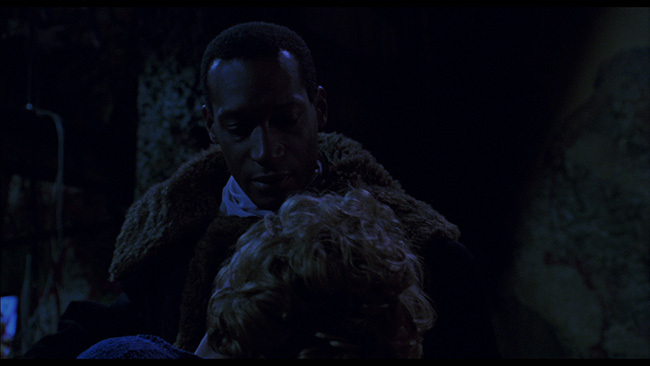 Click on the images below for full sized Candyman Blu-ray screen caps!